Sturdy and easy to use, this glass bottle cutter comes right out of the box and hits the ground running. Spending a little extra for the “Deluxe” kit will also get you a heat tool for assisting with the glass separation process. 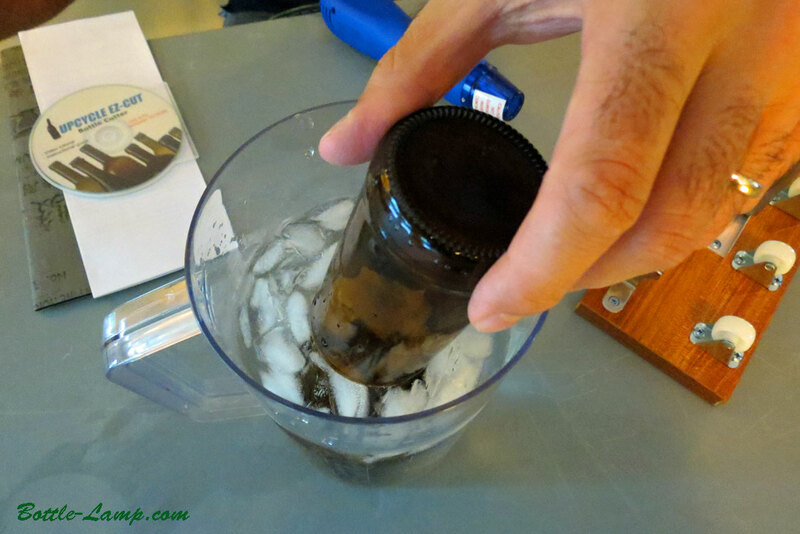 The bottle cutting kit that I received for this review included; the bottle cutter, heat gun, DVD video tutorial, sand paper and instruction sheet. Straightforward and no-nonsense. Why make things complicated? 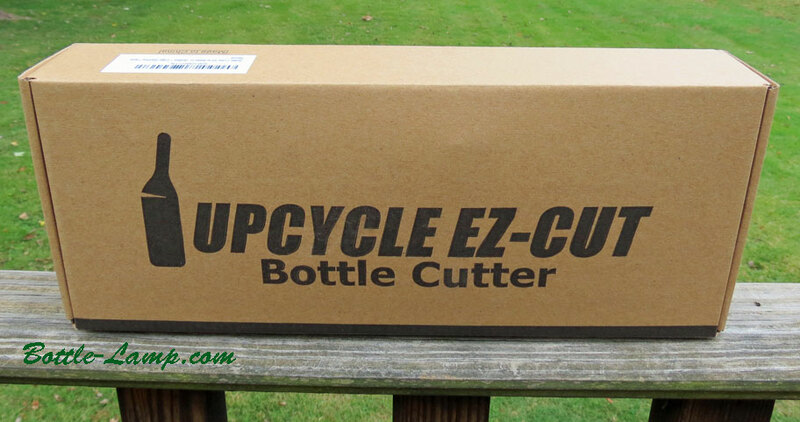 You can easily achieve quality bottle cutting results with the Upcycle EZ-Cut. Having the option to get the “Deluxe” kit allows you to save time and resources with the bottle separation process. 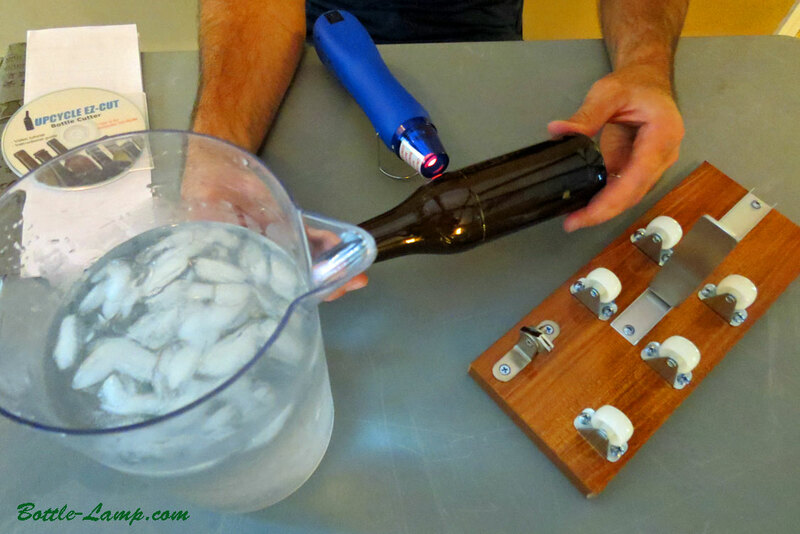 By including a mini heat gun the bottle will separate quickly and smoothly. If you’re in the market for an economically priced bottle cutting kit than you really don’t need to look further. This is it! A quick note about the blue mini heat gun for crafts. 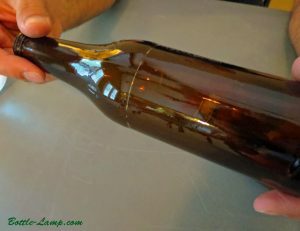 In my initial run with this great bottle crafting tool I treated the gun like a candle and allowed way too much time for the heating process. The gun offers a built-in stand for self-support and a concentrated heat source. Its quick to heat up to 650°F with 320 Watts that is designed to focus on a small area. You really will not have to run the heating gun that long over your separation line, about 45 seconds while continuously turning the glass bottle will be enough. This saves you even more time on top of not having to boil and waste a bunch of water! 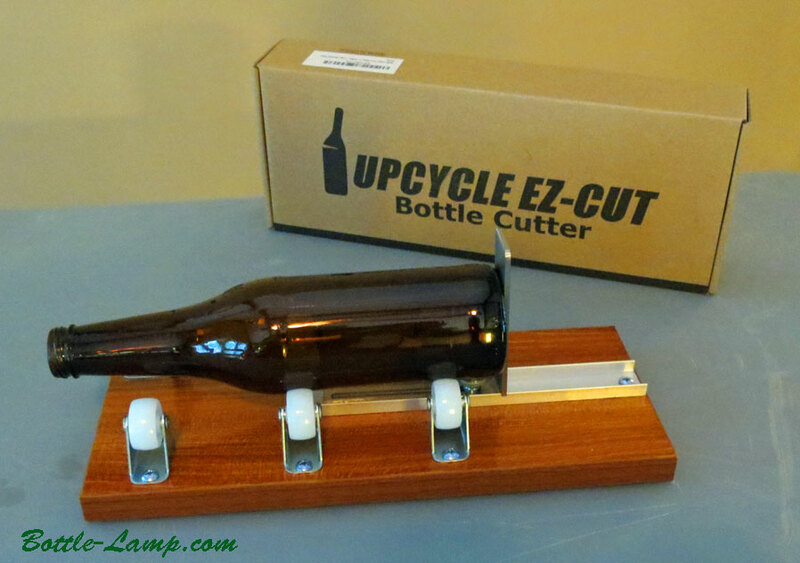 The Upcycle EZ-Cut also offers a bottle cutter without the heat gun. 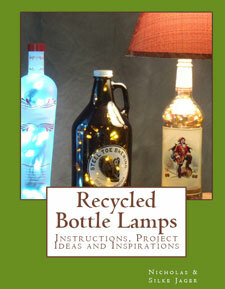 For $31.99 you will get the bottle cutter, sanding paper, and Instructional DVD. The end result of this bottle cutting process was very satisfying. It didn’t take me long at all to have the bottle scored, heated and separated. 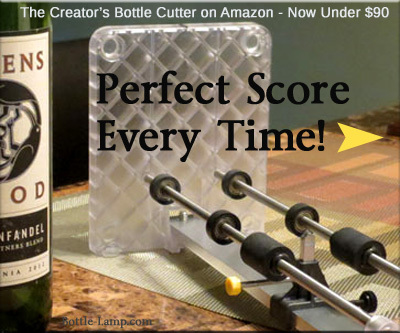 From right out of the box, this bottle cutting kit will allow you to be able to score and separate bottles in little to no time at all. As with anything else in life, you get better with practice. 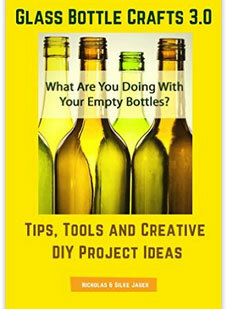 Use a couple throw away bottles before you delve into the ones that you will use in your project. 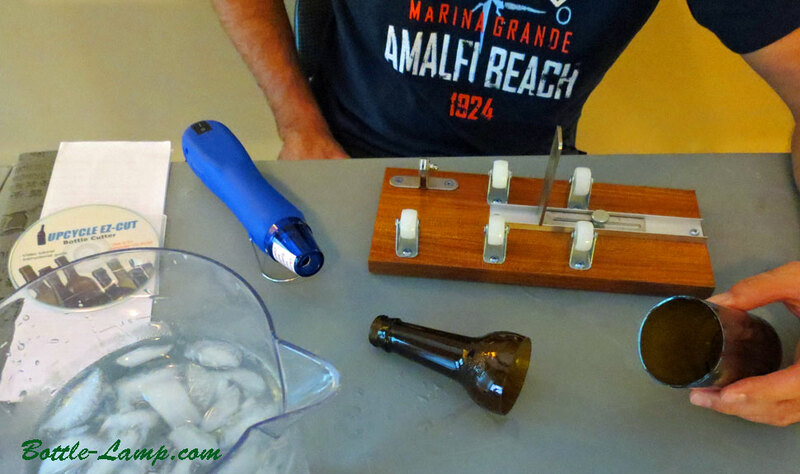 We would like to thank Eric for allowing us to review his bottle cutting tool. Be sure to check out Eric’s Glass Etching website as well. I have tried his etching stencils and cream myself. The bottle etching looks very sharp, elegant and in detail, best of all, the bottle etching was really easy. 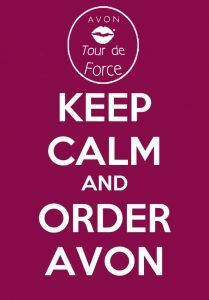 Please feel free to leave us a comment below and let us know what you think! I want to set something up to score bottles for a set a drinking glasses. Once it’s set up I really don’t want to mess with it again. The key is to having them all be the same. My current bottle cutting method is not working out so well. For it’s cost, this seems like the perfect way to go. Thanks for the info! @Carl, thanks for your interest. I’d like to add a tip too for any cutter brand. One important key is to make sure enough pressure is applied while pushing down and turning when scoring the bottle. Including our cutter, it is essential to ensure there is a nice consistent white score line around, or else the bottle will crack in areas. Sometimes it is easier to adjust the cutter blade higher for a consistent score.